Owing to years of experience and knowledge, we manufacture, supply and export wide array of Cotton Fabric Tape. Customers like our Cotton Fabric Tape for their high grade quality and colorfastness. Application Label printing, Garment accessory,Bags,etc. 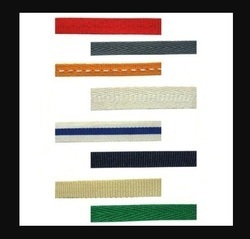 Backed by an expert team of professionals, we have been able to offer an exquisite variety of Cotton Dyed Tape. This tape is manufactured by our team using optimum grade cotton material with advanced machines.. We are offering this tape to our precious clients at reasonable prices.